At least five people were killed Monday as severe storms swept across the South, spinning off several tornadoes and flooding widespread areas already drenched by heavy rain. Four people were killed in a single home when a tornado touched down Monday night in the town of Rehobeth in southeast Alabama, a spokeswoman for the Dothan-Houston County Emergency Management Agency told NBC News. No identities were immediately available. In DeFuniak Springs, Florida, the body of a 70-year-old man was found floating Monday afternoon in floodwaters outside his travel-trailer, the Walton County Sheriff's Office said. The death was ruled an accidental drowning. The storm system drenched parts of Texas early Monday before moving east, causing significant damage from Louisiana to Florida. Much of the damage was caused by flash flooding after a series of storms left much of the region sodden over the past week. "We had spots that picked up a lot of rainfall in a short amount of time — 7 to 9 inches in just a couple of days," said Danielle Banks, a meteorologist for The Weather Channel. Lightning sparked a fire Monday morning at a home in Parker, Texas, NBC Dallas-Fort Worth reported. No injuries were reported, but three fire agencies were needed to put out the raging blaze. In Simpson County, Mississippi, Home and Sweetwater United Methodist Church was pushed off its foundation by a possible tornado, the state Emergency Management Agency said. No injuries were reported, but homes were damaged and power was out for thousands in 18 counties across the state. The Alabama Gulf Coast Zoo in Gulf Shores, meanwhile, will be closed for at least a week after a tornado damaged several animal enclosures, the zoo said Monday. No animals were believed to have been injured. "We've had as much damage in this tornado as we've had in hurricanes that we've gone through," said Patti Hall, the zoo's director. Flash flood warnings remained in affect across southern Alabama near midnight Monday. Flash flood watches were in effect over a much larger region from western Alabama through western South Carolina through Tuesday, the National Weather Service said. The system is expected to hang around until at least early Wednesday over Georgia and Florida, according to the weather service, which said some areas could get as much as 2 more inches of rain before the system moves offshore. CBS Dothan, Alabama affiliate WTVY-TV reports that four people died on Monday night when two trees toppled onto a house in southern Houston County during an apparent tornado. Three others in the home escaped without injury. Houston County Emergency Management Director Chris Judah said: “It is a very dangerous scene. One of the trees cut the trailer in half.” He said those killed had huddled in one area of the mobile home while the other three were in another part. CBS Mobile affiliate WKRG-TV reports the Gulf Shores area was hit with severe winds and rain, but no deaths were reported there. The local zoo is reported to have rescued cages of Lemurs and birds who were blown into a pond on the property. In Mossy Head, Florida, a 70-year-old man drowned Monday, apparently accidentally, the Walton County Sheriff’s Office says, adding that deputies found his car partially submerged “and his body floating face-down” near his trailer. Marksville Fire Chief Jerry Bordelon said a fireworks stand in the Walmart parking lot was tossed 30 or 40 yards and mangled. The storm also knocked over 18-wheel truck trailers and punched holes in the Walmart’s roof. The fire department ordered shoppers to leave the store, but some didn’t want to leave even as managers closed it. Walmart spokeswoman Erica Jones said the Arkansas-based company hopes to reopen the store Tuesday, but isn’t sure that will happen, citing needed repairs to a natural gas line. Despite the rain and storms, large parts of north Alabama and north Georgia remain in “exceptional drought” - the most severe category - according to the center’s most recent report on the drought issued last week. A new report is due out Thursday. The severe storms that spawned tornadoes and killed at least five people across the Southeast Monday triggered more damage than many home and business owners were expecting, and starting a recovery process that could drag on for years. "Didn't expect to see what I saw. Sure I expected something to be torn up but I didn't expect this," Billy Miller, whose barn in Mt. Olive, Miss., was leveled by the storms, told Fox News on Tuesday. "It's a slow process. It's gonna take a year or two years to get done. I'm just glad no one was hurt, that's it," Miller said. Four people were killed Monday when a tree fell on their mobile home in Rehobeth, Alabama, Dothan Houston County Emergency Management Agency spokeswoman Kris Ware said. Ware added that most of the damage was in Rehobeth as winds damaged carports and other buildings, according to AL.com. The National Weather Service had issued a tornado warning for Houston County in the southern part of the state Monday. Local media reported that emergency officials advised residents to stay in the homes and assess damage later in the morning. A man was found dead outside his Florida home in what authorities called an accidental drowning. The Walton County Sheriff’s Office identified the man as 70-year-old William Patrick Corley. Authorities said Corley was found with his body floating face down and his car partially submerged in water. 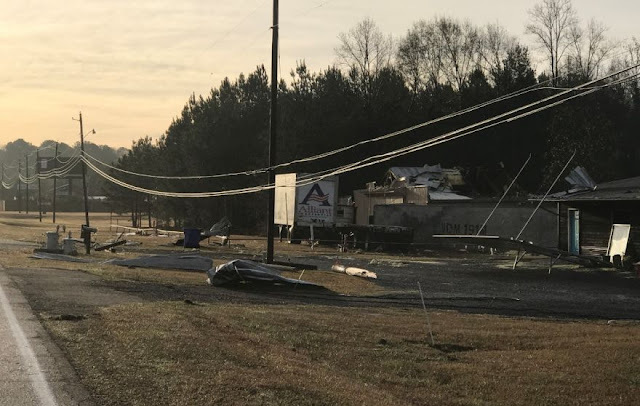 Damaged buildings and a downed transformer appeared Tuesday along U.S. Highway 49 in Mendenhall, Miss., southeast of Jackson, just some of the aftermath across much of the state. Storms ripped through central Mississippi near Mendenhall and Mount Olive. Those storms were determined to produce tornadoes by the National Weather Service. The storms damaged farm buildings and homes. Other possible tornadoes will be surveyed later. 0 Response to "Severe storms sweep South, leaving 5 dead"